MOS integration facilitates seamless news production workflows; new multicam editing features brings advanced editing on the road. Basingstoke, UK – April 3, 2019 – EditShare®, a technology leader in intelligent scale-out storage, Automated Quality Control (AQC), and media management solutions today announced the availability of Flow 2019 Extension 3, adding support for newsroom and multicamera workflows. The software-defined media asset management (MAM) solution, which was released in September 2018, simplifies media sharing and collaboration with embedded production tools to track, search, retrieve, edit, and automate media and media processes across on-premise and cloud-based storage solutions. EditShare’s rapid-fire release schedule has quickly expanded the Flow 2019 capabilities to support a wider range of customer workflows including the latest update which connects newsroom computer systems (NRCS) from Avid, Dalet, ENPS, and Octopus into the overall content production process. 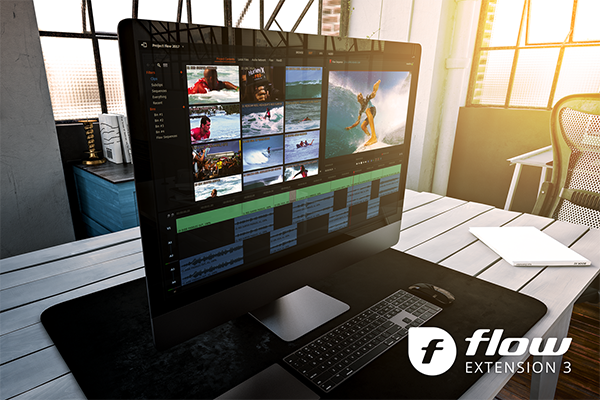 In addition to adding news, Flow 2019 Extension 3 expands editing functionality to include the Emmy award-winning multicam technology developed for Lightworks. Flow 2019 Extension 3 new multicam editing capabilities allow multiple clips to be quickly synchronized using timecode or audio waveform, and then played concurrently for convenient reviewing and logging. Sequences can be built conventionally, or by making a “live” edit from the playing sources, and sequence segments can be instantly swapped for alternate angles at any time. EditShare Flow 2019 is available today in three packages: Basic, Advanced and Enterprise. Volume pricing is also available. Users can test-drive Flow by downloading a free 14-day trial at: my.editshare.com. For more information, visit flow.editshare.com or please contact sales@editshare.com.